ALREADY HAVE AN ACCOUNT WITH ONE OF THESE KIMBERLY-CLARK BRANDS? You can use the same email address and password to sign in to Pull-Ups®. Join in the fun by registering with Pull-Ups®. Partner with your child and discover a personalized potty training program that's as easy as 1,2,3. 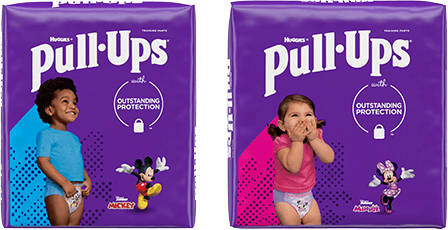 Introduce your child to Pull-Ups® and start training together. When it comes to potty training, personality matters. We’ve developed five toddler personalities and tips on how to train for each personality type. Our products help teach potty skills with reliable protection where boys need it most. TRAINING PANTS DESIGNED TO HELP LITTLE BOYS KNOW WHEN TO GO POTTY.